A series of work exploring the lives of the East Lothian fishwives. My research began as I discovered the local legend of “Half Hung Maggie” – the story of Maggie Dickson, a Musselburgh fishwife, who was hung in Edinburgh in 1723 and who miraculously revived as her body was carted home. Rather than the drama of the tale it was the lives of the fishwives that captivated me and led me into finding out more about this strong community of women. My current inspiration is a series of postcards sent to one fisher family from the men while they were away at sea. Dated in the early 1900s they are our equivalent to a daily text message or phone call home reporting on the important issues of the day – the men’s health, the weather, the fishing and, of course, the money they will be bringing home. The stripes represent the women at home. An important part of their identity as fishwives was the blue and white striped skirts and aprons they wore. I continue to explore the thought that fabric captures and holds memory and that the garments we wear carry our story. I treat these as archaeological “finds”. 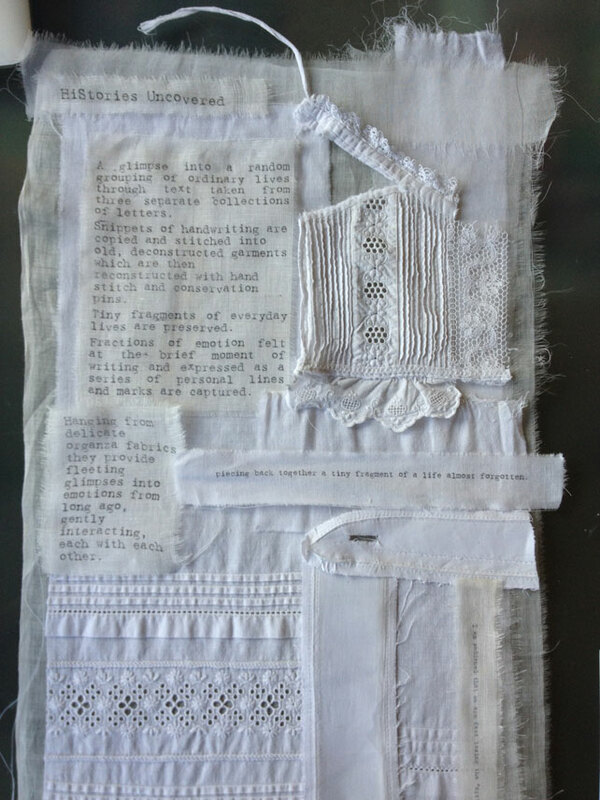 Displayed as museum exhibits, these imagined fragments of history are pieced together with hand stitch and conservation pins & stitches. I use primarily materials that themselves are used, washed and worn – bringing their own stories. Used ticking & organza are stitched, where possible, with vintage threads. Inspiration for To The Creel by Ali Ferguson. The postcards offer a tiny glimpse into family life connecting the men at sea to the women at home. Filleting, Gutting, Hawking by Ali Ferguson. Hand-stitched textile fragments sewn into a wood and perspex hand crafted display case. Filleting, Gutting, Hawking detail by Ali Ferguson. Hand-stitched textile fragments sewn into a wood and perspex hand crafted display case. Dear Wife by Ali Ferguson. Hand-stitched textile fragments sewn into a wood and perspex hand crafted display case. Dear Wife detail by Ali Ferguson. Hand-stitched textile fragments sewn into a wood and perspex hand crafted display case. Dear Sister by Ali Ferguson. Hand-stitched textile fragments sewn into a wood and perspex hand crafted display case. 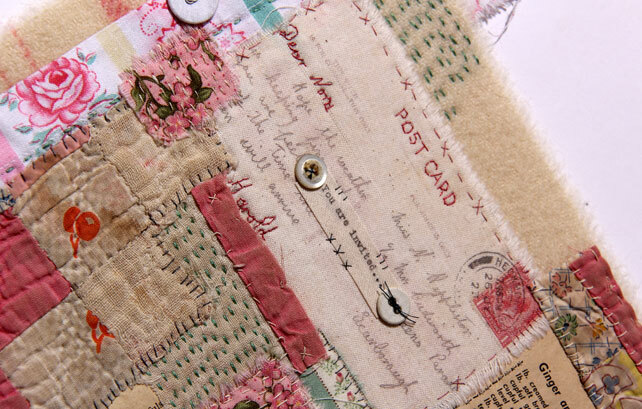 Dear Sister Detail by Ali Ferguson. Hand-stitched textile fragments sewn into a wood and perspex hand crafted display case.